Houzz hand-picked our recent Laundry space project as a feature in the online editorial "10 Small-But-Mighty Laundry Stations for an Easier Washday". Jackson Design Build received a 1st place Award at the 2018 NKBA Design Competition for the laundry station in this Crown Hill Basement remodel. Josh and Mollie Zautke welcome Ila Jade! On November 17, 2014, at 3:17 PM, this beautiful girl joined the "team". Mother and baby are happy and healthy, yay! She looks perfect to us! 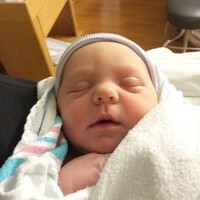 Welcome Ila Jade Zautke, and congratulations Josh and Mollie! 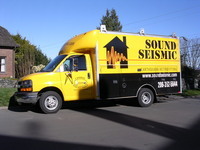 "Super Service Award" for Jackson Remodeling and Sound Seismic! 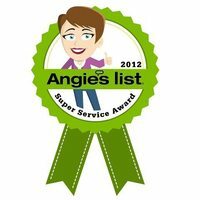 Jackson Remodeling and Sound Seismic received the Angie's List Super Service Award.The honor is for companies who receive member ratings among the top 5% of all companies rated. Thank you to all of our team members who provided the exceptional service! Thank you to those of you who reviewed and rated our companies, on Angie's List, Yelp, or elsewhere! Jackson Remodeling participating in the 1st annual Green Home Tour, April 16-17, 2011. Jackson Remodeling's remodel of a Madrona neighborhood kitchen was deemed "Best Kitchen $125,000-$175,000" in the 2011 REX Awards. The annual awards recognize Remodeling EXcellence, and is sponsored by the Master Builders Association of King and Snohomish Counties. This gourmet workspace was built by lead carpenter Willie Johnston and designed largely by Michelle Molloy. Congratulations to the Jackson Remodeling team! Both Jackson Remodeling and Sound Seismic will have booths. Come say Hi to Erik and Leif. CoolMom.org and Westside Baby organized a car seat recycling event October 10, 2010. 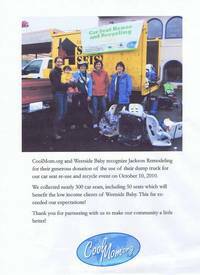 They collected about 300 car seats for re-use and recycle. Jackson Remodeling was honored to be able to help in a small way with this great effort. Jackson Remodeling LLC is now fully compliant with the new EPA requirements that take effect April 22, 2010. Building on our commitment to create healthier homes for our clients, we have taken steps to become a Certified Firm. And after completing 8 hours of training with EPA trainers, each and every team member is now a Certified Renovator. This makes Jackson Remodeling qualified to work on older homes in ways that are safer for the residents, especially children. Most of the new requirements have to do with keeping a clean job site and protecting the home from dust - things we have always done. But we learned a trick or two, and are already incorporating these new procedures into our remodels. 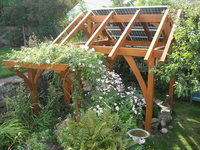 Jackson Remodeling had the privilege of working with our clients on Phinney Ridge and Smart Solar Solution, to create a photovoltaic koi pond gazebo (our first!). It turned out so cool that Smart Solar Solution showed it off during the Solar Washington Tour, October 3, 2009. Jackson Remodeling is proud to help sponsor the Sustainable Ballard Festival for the second year! This organization is all about local and green, so come on down and learn what it's all about. Saturday and Sunday, September 26 and 27, 2009. Ballard Commons Park (corner of NW 56th Street and 22nd Avenue NW, by the Ballard Library). When EcoHome Magazine needed a green remodeling expert to talk about how the industry has been affected by the economic downturn, they turned to Leif Jackson. Doing good work is its own reward, but it's nice when the local press takes notice, too. When KING 5 wanted to talk to a remodeling expert about building green, they asked Leif Jackson. Click to watch the VIDEO. Jackson Remodeling has been doing green remodels since 2001, but until now have still remodeled with traditional methods and materials as well. No more. In June, Jackson announced that green will now be the ONLY way they do business. Once they complete a few jobs already in design, the firm will simply not build with materials or methods unless they are sustainable, efficient, and healthy. Jackson Remodeling's Ballard bathroom wins state award! 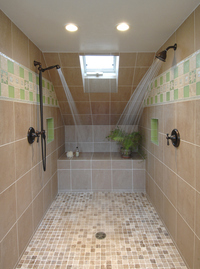 The Building Industry Association of Washington recognized Jackson Remodeling by awarding their entry "Best bathroom over $75,000" in the 2008 REX awards in June. Maya Jackson's Human Rights Essay Best in Citywide Contest. Sixth graders from McClure Middle School swept the top three places in City Year's 2008 "If not now, when?" essay contest in honor of Rev. Martin Luther King, Jr. Leif and Sarah's daughter Maya took home first place honors. 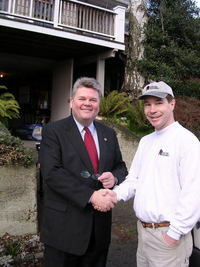 Leif Jackson was one of several remodeling experts quoted in the Seattle P-I article of 12/9/07. Leif recently completed the educational requirements to achieve designation as a Certified Aging in Place Specialist. An open attitude elevated this company to expert status. Erik and Diane's family has just grown by one person - Dylan Kai Jackson arrived July 9, 2007! Dylan was born at 5:58 PM, weighing 8 pounds six ounces and measuring 21.5". 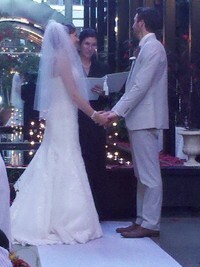 Welcome to the family, Dylan!!! In the September 2007 issue of Northwest Home + Garden, Jackson Remodeling is recognized as one of "Seattle's Top Remodelers"! Our Wedgwood remodel proved to be a big winner in the 2007 REX competitions. ! Maya Jackson and her Queen Anne little league softball team elevated their game in the post-season, advancing to the citywide finals in the Tournament of Champions! Jackson Remodeling's earthquake retrofitting division is featured in the pilot episode of this new home improvement show. In a ceremony May 17th, Deputy Mayor Tim Ceis presented Leif Jackson and Roy Fleisher of Jackson Remodeling with a certificate of recognition from Seattle Mayor Greg Nickels. The document applauds the Jackson team for their volunteer work building a wheelchair ramp for the Owens family of Greenwood. The Jackson Remodeling Hammerheads take the T-ball field in the Spring of 2007. May, 2006 - Jackson Remodeling was awarded one of the industry's highest honors May 18th, when they were added to Remodeling Magazine's prestigious BIG 50 list. Big 50 is somewhat of a misnomer, as it has nothing to do with the size of the company recognized. Instead it is all about quality work, impeccable ethics, business acumen and outstanding customer service. In a ceremony presided over by Seattle Mayor Greg Nickles, the Seattle Office of Emergency Management kicked off its renewed earthquake retrofit grant program.